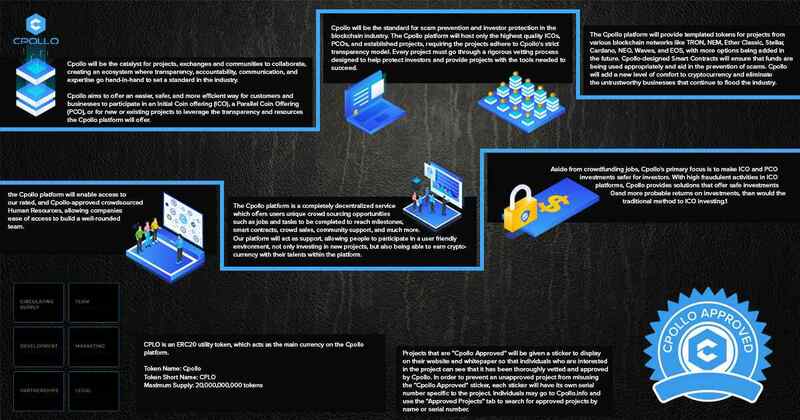 CPOLLO is a platform which is defined as an open and a crowdsourced project which utilizes the power of blockchain technology and decentralization to promote faster, more secure, and more efficient crowdsourcing services. The CPOLLO platform aims to serve as a transparent and unbiased hub for ICOs. People will be able to create a templated ERC-20 token, as well as a templated token on any one of the following networks: Ethereum, TRON, NEM, Ether Classic, Stellar, Cardano, NEO, Waves, and EOS, with more options being added in the future.